For the past decade, the staff at FoodWhat has used sustainable food, meaningful work and farming to help youth heal, grow, and explore their identities. 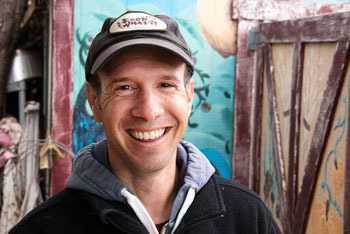 Doron Comerchero, founder of the nonprofit FoodWhat, uses sustainable food and farming as a way to empower struggling and low-income youth in Santa Cruz County. For the past decade, he and his staff have worked hard to provide them with healthy food, meaningful work, and a supportive community. Now, his labors, outreach, and vision are getting the recognition they deserve. Comerchero, 40, is the ninth recipient of the annual Tony Hill Award, a prestigious honor that is given to bridge-builders and community organizers who embody the spirit of the late social activist Tony Hill. Hill, a longtime advocate for social and economic justice in Santa Cruz County, was known for his skills as a mediator. He died in 2007 at age 62. Comerchero received this honor during the 33rd annual Martin Luther King Jr. Convocation ceremony in downtown Santa Cruz on Thursday. Stern also praised Comerchero’s unique approach to social justice issues. “FoodWhat provides opportunities for young people to discover more about themselves through their connection with the land, through fostering new capabilities and hope for the future,” she said. The nonprofit has a distinctive and instantly recognizable logo, featuring a carrot, a tomato, and the words “FOOD WHAT? !” in oversized letters. This organization has deep roots at UC Santa Cruz. Comerchero was an apprentice with the campus’s Center For Agroeceology & Sustainable Food Systems in 2004, and stayed on for a second year in 2005. His nonprofit now operates in two locations—on a small parcel of land at the UC Santa Cruz Farm, and at another parcel at Farm Discovery at Live Earth Farm on Green Valley Road in Watsonville. The convocation crowd, including a large contingent of youth who have worked with the nonprofit, gave him a rousing welcome as he approached the podium. Comerchero noted that 2007, the year that Tony Hill died, was also the year his organization launched. “Somewhere I trust in my heart that Tony has been sharing his spirit, his passion and his wisdom with us,” he said. The food grown on-site at FoodWhat is prepared and consumed in daily healthy meals by youth participants. Shares of youth-grown produce grown goes home with the youth and their families, and is used to support youth-run low-income farm stands in both sides of the county.